Clear waters and white sandy beaches are as fun to play and relax on, as they are breathtaking. The 32 miles of Alabama's white sandy Gulf Shores beaches are made from Quartz grains washed down from the Appalachian Mountains thousands of years ago. The sand is so soft, it squeaks between your toes. Learn more about our local Gulf Coast beaches with our Gulf Shores beach guide. We are happy to offer a range of Gulf Shores beachfront rentals located directly on these beaches. 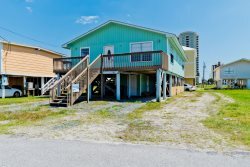 Whether you are looking for a large Gulf Shores beach house or Orange Beach beachfront condo close to the action, we have the perfect rental for you! Book your Gulf Shores beach house rental today and prepare to spend mornings wake up to the smell of the sea and evenings watching the sunset over the emerald waters. Contact our office for assistance finding the perfect Gulf Coast rental for you!